Aesthetic dentistry is an art form, one at which Dr. Jerry Lim is passionate about. He believes in establishing a functional approach to a patients aesthetic smile enhancements. Dr. Lim currently holds an adjunct lecturer position at his alma mater, National University of Singapore. In addition, he was the past President of the College of General Dental Practitioners Singapore. Recently, Doctor X Dentist featured Orchard Scotts Dental’s very own Dr. Jerry Lim in one of their D x D Interview Sessions. Doctor X Dentist is a web-based company which helps people find dental and medical information by interviewing leading professionals in the fields of dentistry and medicine. 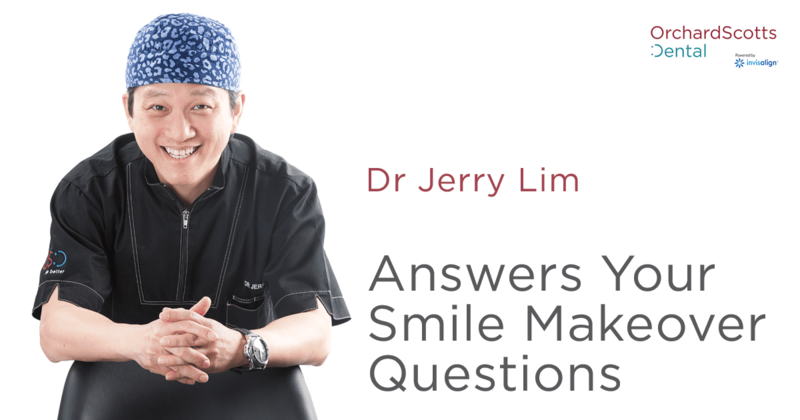 Dr. Lim was asked over a dozen dentistry questions ranging from how to fix chipped and crooked teeth to teeth whitening to application of porcelain veneers and so much more. He answered in terms which are easy to understand so that any reader can make the most informed decision concerning their own dental health. Here at Orchard Scotts Dental, we’ve broken down the five most popular questions Dr. Lim answered. You’ve got questions and we’ve got answers. Q1: Can I correct an overbite by wearing braces just on my lower teeth? A: Straight answer is No. This is because in an overbite situation, when the lower teeth are rearranged, their arc circumference on the lower jaw will be larger than before. This happens when the crowded teeth are slowly spaced out into a well aligned arch. Therefore, if braces are not placed on the upper teeth, they may not meet with the new lower teeth properly causing your bite to become compromised. Your bite would feel uncomfortable and the function may be slightly impaired when the teeth are gnashing on each other prematurely. It is therefore less possible to complete only a bottom teeth treatment, unless the lower teeth are trimmed between without widening the arch. However, creating space by trimming alone is not recommended as the first choice of treatment planning. Note: Overbite happens to be one of the dental issues which can be fixed using Invisalign. In fact, Invisalign in Singapore is fast becoming a very common way to align your teeth than with regular braces. Q2: How can I avoid veneers which appear fake? A: Creating a perfect smile is about more than colour alone. Your dentist needs to correct teeth inclination and shape while making sure to preserve the naturally-occurring spaces between each tooth. Our eyes are quick to pick up anything unnatural in other people’s appearances. For instance, the following may appear unnatural: bulky teeth, teeth at the incorrect angle, teeth which are too opaque or monotone in colour, or teeth which appear too rounded. To create a gorgeous smile, we look for elements of the natural teeth and enhance them. All smile parameters should be taken into consideration, such as: teeth length, colour, angle and shape, as well as gum level. At Orchard Scotts Dental, we also look into the fullness of the smile to see if there is any room for improvement. Basically, we look into the ABCs of your smile—alignment, brightness and contour. Often, we move teeth before applying veneers so we can trim less of your teeth and adopt a minimally invasive approach for the perfect smile. Hopefully, this has given you the information you need in order to request the natural-looking veneers you desire. Q3: What is the average cost for a smile makeover in Singapore? A: In general, creating a beautiful smile using our Smile Makeover signature service ranges from $1,500 all the way up to $5,000, based on a few different factors. On average, teeth whitening in Singapore costs $1,200 while veneers range between $1,500-$2,500 for each tooth. A recent patient wanted stains removed from her teeth. She tried many methods but the stains stayed. Using the controlled Power Whitening procedure with an Orchard Scotts Dental at-home whitening kit, her teeth were whitened successfully. The combination cost was $1,284, without the need for any ceramic veneers. In cases where whitening procedures won’t work, dental veneers may be necessary to achieve the desired bright white smile. Veneer cost fluctuates according to experience, material cost, expertise, technology and number of procedures needed. Usually, veneers cost between $1,500-$2,500 depending on the aforementioned factors. Q4: What is the average cost for dental bonding in Singapore, and what factors impact cost? A: Usually, dental bonding fluctuates between $300 to $500 for each tooth. In the case of someone with a gap between their teeth, dental bonding would be recommended. This involves adhesively bonding a natural-coloured composite to the tooth’s side, so it extends partially to cover the gap. The same is done to the adjacent tooth, closing the space between them. The factors which impact cost include: the number of teeth being treated, the size of the treatment area and any additional treatments which may be needed or requested. Q5: How much pain do dental veneers cause? I am scared of any dental procedure. A: Great news! Dental veneers are not usually painful because the work involves the outside of the tooth, away from the sensitive inner nerve. After your dentist from Orchard Scotts Dental numbs your gums and teeth, you won’t feel much during the process. You are not alone in having a phobia of dentists and dental procedures. Many patients have similar fears. If you’re feeling anxious before a procedure, you can always ask to have some nitrous oxide or laughing gas to calm down. There is also one more solution: IV sedation. This option allows you to sleep comfortably and wake up when the entire process is over. Demystifying aesthetic dentistry is what we’re all about here at Orchard Scotts Dental. As Dr. Lim showed in his Doctor X Dentist interview, bringing answers to people seeking professional dental help is our true passion. With extensive experience and a true goal of bringing better dentistry to more people, Orchard Scotts Dental is the dental clinic that cares. Contact us today for more information regarding the above questions or to start your own journey towards a perfect smile. We look forward to hearing from you.